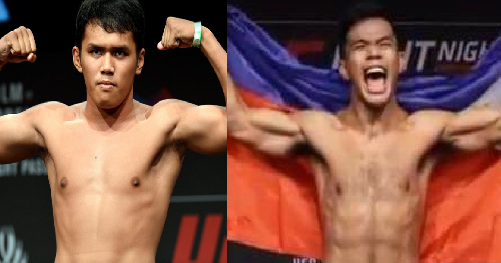 Two Filipino fighters Carls John De Tomas and Rolando Dy was defeated in their UFC debut today in Singapore. CJ De Tomas was fought hard using his wrestling skills but the speed and the BJJ skills of the Japanese Naoki Inoue was superb. CJ De Tomas tried to connect and get some momentum in 3 rounds But the Japanese retain his undefeated record with his pretty MMA talents. Meanwhile, Rolando Dy was also defeated in his debut fight against the veteran UFC fighter Alex Caceres. Caceres connects two left punch combinations in the first round that hurt the Filipino Rolando Dy and causes an eye injury. Caceres took the advantage, throws multiple combinations and tried to submit the Filipino, but Dy remains dangerous at that time. Dy continued to fight in the second round and had some good strikes and combinations with his one eye but after the second round, the referee managed stops the fights before the 3rd round begins. Caceres won via TKO (eye injury) but still give a credit to Rolando Dy as he bravely fought and still showed some potential. Aside from Dy and de Tomas, Lausa is also one of the Filipino fighters who fought and currently has a contract with the UFC.